Other reference sources for Russian tank accuracy. 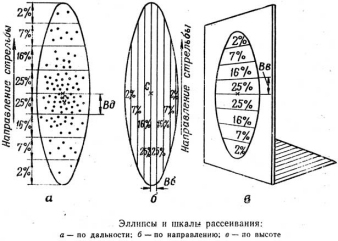 The Russian document on dispersion is seen as an ellipse (below left) which is more realistic than the US Dispersion Rectangle on page 39. A point of possible confusion is the Soviet 50% median error as shown to the right. But the US translation of a captured Russian document on the right is incorrect. Figures are for 25% zone. Thus the 'B6' and 'BB' figures are equivalent to US/British horizontal and vertical median deviation figures. 122mm D-25 V= 0.6m, H= 0.495m. 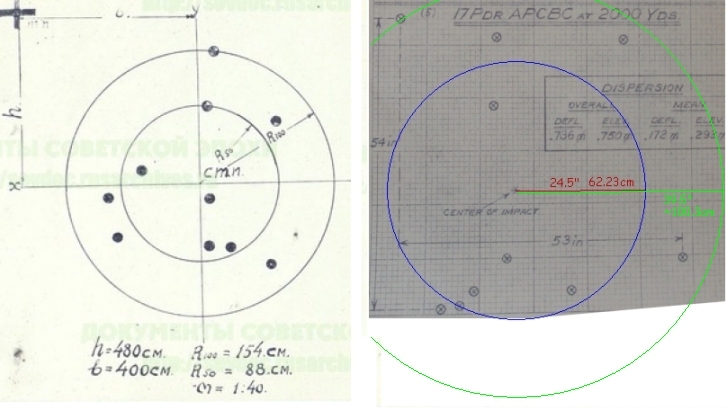 To the right is a figure from a Russian document that has the mean dispersion of the German 88mm/L71 from testing. Several different test firing were made. Two sets of 10 shots at 1000m and one set of 10 shots at 2000m. If all were to be averaged to find the dispersion at 1000m we get: V=23.33cm, H=20 cm. Convert this to German 50% zone: V= 0.466m, H= 0.4m. This is actually better than what the Germans have for the gun in their tabular data table page 34. 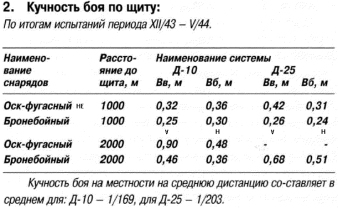 Something I noticed is that the vertical dispersion of Russian tests is not as high a ratio of the horizontal as in German or American tests. I don't know why it is that way. It might be caused by the test gun mount which may make the barrel whip or gun jump behave differently. Other than that guess I have no idea. A recent page of Archive Aware on IS-3 Gunnery Trials is a dispersion test. The results show an average dispersion of 50% of the test shells at 2000m is 88 cm. Now compare this accuracy to that of the British 17 pounder dispersion on the Chieftains Blog The dispersion of 50% of the hits is 24.5" or ~62.23 cm at 2000 yds. Which is equivalent ratio to ~68 cm. at 2000m. The extreme dispersion is 39.5" or ~ 100 cm at 2000 yds or ~110 cm at 2000 m.
However, the height and width of the dispersion measurement of the British test really are not as scientifically based as the radial data of Soviet test. It also looks like the aiming point on the Soviet test is the '+' point. This puts the zero way off target. 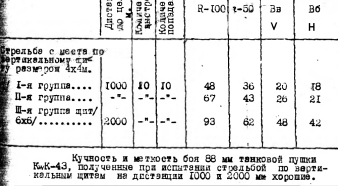 Some links to US data on Soviet guns. Remember th US mis-translated the median deviation as mean deviation.